In March 2014, the Las Vegas skyline was altered for good with the completion of the world’s tallest observation wheel. The latest addition to Caesars Entertainment’s exclusive The LINQ resort; The High Roller now rises above the cityscape of Las Vegas. Shaped like a giant floating hoop, The High Roller is illuminated from sunset throughout the night by fixtures from Martin Professional’s Tripix range of products. Commissioned by Caesars Entertainment back in 2009 with an overall vision to change the Las Vegas Skyline with a new iconic landmark, the taxing project to realize the world’s tallest observation wheel began. On the lighting side of this extravagant architectural project, NYXdesign teamed up with Martin Professional, systems integrator 4Wall Entertainment and electrical contractors Bombard Electric. A lot of thought went into the design of the lighting solution, with positioning of the fixtures an especially crucial element due to the rounded shape of the structure and the inability of light to bend. With each section of the actual steel wheel being developed in China, it was not possible for the fixtures to be repositioned following completion of the structure. To ensure that each fixture was correctly positioned prior to completion, a 20-foot wooden prototype of a single section was constructed in a Hollywood studio where various positions were tested and finalized. Martin also developed a custom mounting bracket to mount the fixtures onto the rim and a number of vibration tests were conducted to guarantee long term quality. Additionally, Martin developed a custom-built 227 V power supply to match the requirements from the electrical engineers. One major challenge that had to be considered in the early stages of the project was to accommodate the user experience from both inside the cabins and from various angles and viewing distances make the lighting design successful from every possible perspective. The Tripix products were chosen because at the time they were the only fixtures on the market with a converged light source, also known as a tri-color chip, meaning that when you look directly at the light source you only see the color that the fixtures is programmed to show. As visitors would be able to see directly into the light source from the cabins, a traditional RGB light source was not an option. It was also relevant to use fixtures that would match and complement the modern and clean design of the structure. The Tripix range ticked this box as well and to integrate them completely as part of the design, the fixtures and the customized brackets were given a custom finish. This way they became part of the structure without being a distraction. 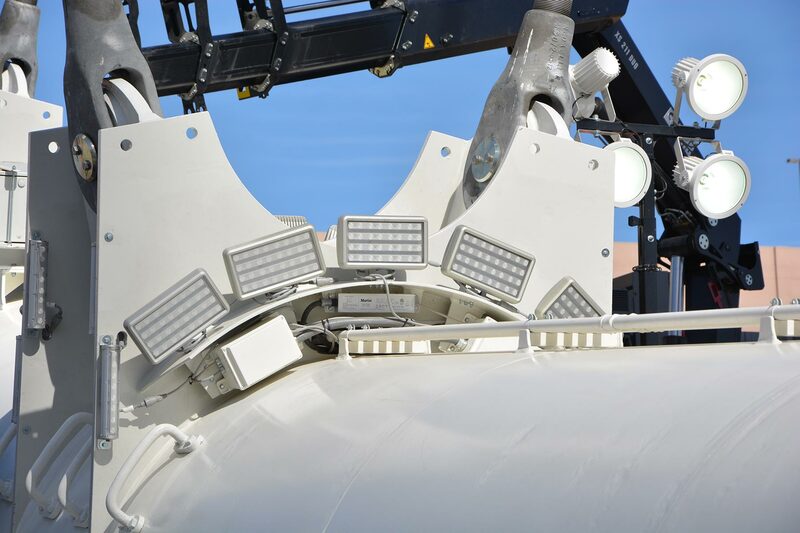 For the electrical contractor, Bombard, the main obstacle was gaining access to the fixture locations on the wheel. In order to achieve the desired result it took a major coordination effort to get the rim to move into more installation friendly positions. Holmes was approached by the architects because of her diverse background in concert lighting, TV studio design, theme parks and installation projects. Interestingly, the architects were looking for a Lighting Designer with a background in music lighting for this architectural project and Holmes’ theme park experience also proved valuable for this project. To Holmes it was a gift that David Codiga (Executive Project Director, The Linq) Randy Printz (Project Manager, Themed Development) and Phil Hettema (Creative Director, The Hettema Group) always had such a clear vision of what they wanted the structure to be. Every detail was carefully worked out to make the structure appear as modern and streamlined as possible. The guidelines for the lighting design was that it had to respect the beauty and simplicity of the structure, while at the same time embracing its kinetic qualities. In contrast to many other examples of Las Vegas lighting, the design for the High Roller should not be flashy and carnival-like. These guidelines have impacted every aspect of the lighting design, including how the patterns could run in subtle ways to emphasize the dimensionality and kinetic qualities of the wheel. The structure is large and very slim, so lighting can be programmed to give spectators a perception of 3D qualities. Even though the fixtures are moving around with the rim it is possible to program them to make the wheel appear to be one color in the bottom half and another in the top half. The programming frequently returns to white to reestablish the pure form of the object, and there are subtle design choices that may not all be grasped by spectators, but still contribute to the overall perception of the design. As the sun goes down a slightly different time every day, there are 365 individual cues timed to actual sunset. It starts with a sequence designed to play from sunset to dark. When darkness falls another set of sequences carry on all through the night. A set of special sequences have been designed for holidays and special events, including (according to Holmes) an awesome one for Halloween. There is an obvious challenge in lighting up a structure like The High Roller. Unlike The London Eye, which is designed as an open truss structure, The High Roller is a massive white object that has to be illuminated from the outside. “The 2,000 Martin fixtures were individually mapped and numbered to provide the detail and variety we wanted in the programming. This formed the basis of the varied movement patterns and groups which play out in the programming for the wheel lighting." When the structure itself and the implementation of the lighting solution was complete an extensive phase began to implement the final lighting design. Holmes, working with programmer Jason Badger, created the initial wheel lighting sequences using an offline 3d visualizer, allowing the project team to further review and develop the feel and aesthetic of the programming prior to the installation. For onsite programming, a position was set up on a hotel balcony overlooking The High Roller. All the fixtures are wirelessly DMX-controlled, and during this phase all the pre-programmed sequences were tested and more were developed. More than a year into its lifetime The High Roller has become an integral part of the Las Vegas Skyline with its beautiful shape and elegant lighting design, making it fully deserving of its status as the latest and greatest Vegas landmark. A lot of skilled and professional people participated in this tremendous project to whom all credit is due. This story centers around the lighting part of the project why all contributors to the project are not included below. However, you can read about the entire project on Lighting and Sound America. Tripix Power IP66, 560 pcs. The High Roller project also features a complete Harman audio solution provided by JBL, Crown and BSS.